SANTA CLARA, Calif.--(BUSINESS WIRE)--OmniTier Inc., a cloud solutions company, announces the availability of its flagship software stack, MemStac. Designed for a tiered memory architecture utilizing NVMe SSDs and small amounts of DRAM, MemStac is capable of exceeding 7 million cache requests per second and supporting up to 4 terabytes cache capacity per server node at a fraction of the cost of today’s DRAM-only solutions. MemStac is fully Memcached compliant and can be integrated into existing cache clusters seamlessly, requiring no changes to the existing application (client) libraries. Modern cloud datacenters use extensive low-latency access DRAM caching to improve application performance. Often, insufficient cache capacity leads to excessive networking and database querying overheads, thereby slowing application performance. While DRAM-only solutions deliver excellent response time, they are relatively expensive, high power, and low capacity. By contrast, NVMe SSDs are relatively inexpensive, low power, and high capacity, but significantly lower performance than DRAM. 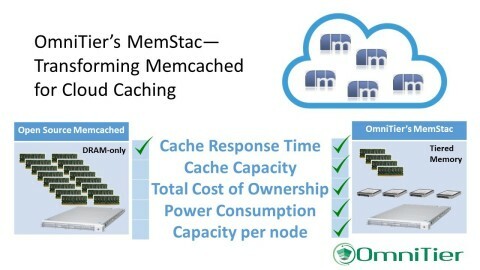 OmniTier’s software stack, MemStac, delivers a function-optimized Memcached solution for in-memory caching in the cloud. MemStac enables the use of a cache tier combining NVMe SSDs with a small fraction of total storage resident in DRAM. MemStac’s tiered-memory architecture dramatically reduces the cost associated with server memory; datacenter operators can optimize for both capacity and response time, delivering higher application performance at a fraction of the cost of DRAM-only solutions. Using select off-the-shelf NVMe SSDs as cache memory within a standard Intel dual-socket server, MemStac delivers native SSD performance at 3.7M operations per second (100 percent Get operations) and 3.2M operations per second (80 percent Get operations / 20 percent Set operations) for 100 byte records. With widely-used workloads, this performance increases to an industry-leading 6.1M and 4.7M operations per second, respectively, using DRAM storage at one-eighth of the cache capacity. These levels of performance are achieved with less than 1 millisecond average latency. In addition, MemStac seamlessly delivers 10GbE network-limited throughput with typical workloads exceeding 250 bytes in average size, similar to the DRAM-only open-source solutions. MemStac’s unique multi-threaded architecture allows better scalability over multiple cores and enhanced processor utilization when compared to standard open-source offerings, while enabling ease of installation by minimizing external sharding. To ensure durability, MemStac incorporates data handling techniques that create SSD-friendly operations to extend the device’s endurance and capacity while maintaining excellent performance characteristics. These techniques extend to more complex memory tiering based on the availability of new storage class memories. MemStac is sampling this month with selected partners. For further information, contact sales@omnitier.com. OmniTier Inc., founded in 2015, is a developer of high-performance, function-optimized solutions for modern datacenter infrastructure applications, including data caching, NoSQL, and real-time analytics using novel memory-management architectures. Its leadership team has a track record of delivering many “industry firsts” in data storage and access across different media types. The company currently has offices in Santa Clara, California, and Rochester, Minnesota.